Marble. First half of the 2nd century CE. Originally the head was a part of a statue “with a veiled head” (capite velato) as indicated by the rear part, though heavily damaged. 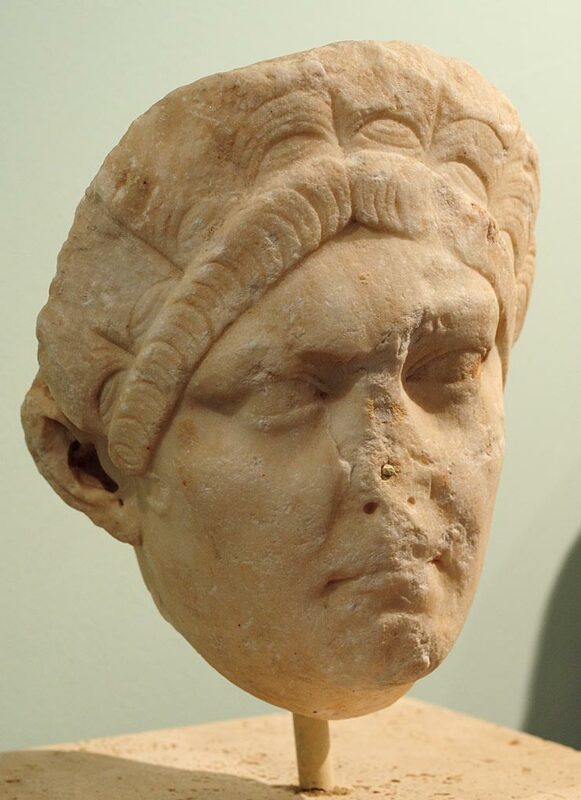 The features and the hairdress with a diadema bear a great resemblance to monetal and sculptoreal portraits of Marciana, the sister of imperator Trajan (98-117 A.D.). Therefore the sculpture was interpreted as an honorary one, probably posthumous, of the Augusta, deified after death (112 A.D.). E. Camporini, Corpus Signorum Imperii Romani. Regio XI. Mediolanum-Comum I, Milano 1979, n. 78, pag.91.